Join us for a night of winetasting at Olalla Vineyard and Winery. Enjoy some live music, wonderful wine, and some fabulous food. 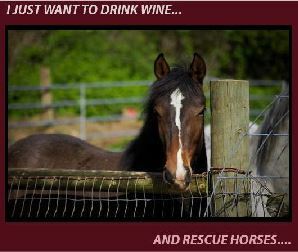 All proceeds from the event go to the care of our current herd at Pony Up Rescue for Equines. Tickets are on sale now! There are a limited amount of tickets, so don’t wait! Reserve your spot now! Need to buy tickets? Here’s how! When you get to the donate screen be sure to click the “designate to a specific fund” and make sure the amount you’re putting is appropriate for the number of tickets you’re purchasing (ex. $35.00 for 1 ticket, $70.00 for 2, etc.). Select the “DeCanter Winetasting Fundraiser Ticket” option under the Fund you’re selecting. (please see screen shot below). Complete the rest of the required information and submit payment. *Please note* do not select anonymous for this specific donation. We need your name so we know that you have bought a ticket. Have questions? Please shoot us an email message!